« A Possible Peace Treaty Between Statists and Libertarians?!? Have you ever wondered why, in a hypothetical match-up, the American people would elect Ronald Reagan over Barack Obama in a landslide? And have you ever wondered why Americans rate Reagan as the best post-WWII President and put Obama in last place? There are probably a couple of reasons for these polling numbers, but I suspect one reason for the gap is that Reaganomics generated much better results than Obamanomics. I’ve already made this point using data from the Minneapolis Federal Reserve Bank, but today we’re going to look at some updated information from Tom Blumer, who put together a strong indictment of Obama’s record for PJ Media. He points out that both Reagan and Obama inherited very weak economies. But that’s where the similarity ends. Reagan pushed an agenda of free markets and small government while Obama doubled down on Bush’s statism. The results, he explains, confirm that big government is the problem rather than solution. Obama’s economic policy, with the help of a pliant Federal Reserve, has been built on the notion that massive deficit spending and easy money would bring the economy roaring back and “stimulate” job growth. The former strategy was tried during the 1930s. It only succeeded in lengthening the Great Depression, as the nation’s unemployment rate never fell below 12 percent. The fact that Team Obama insisted on making the same mistakes, while at the same time unleashing the federal government’s regulatory apparatus to harass the economy’s productive participants, is enough to make reasonable people question whether this president and his administration have ever truly wanted to see a genuine recovery occur. On the other hand, five years of strong, solid and uninterrupted economic performance following a serious recession is how you create a positive economic legacy. Ronald Reagan’s post-recession economy — an economy which faced arguably greater challenges when he took office, particularly double-digit inflation and a prime interest rate of 20 percent — did just that. Those are strong words, but I think the accompanying graphics are even more persuasive. 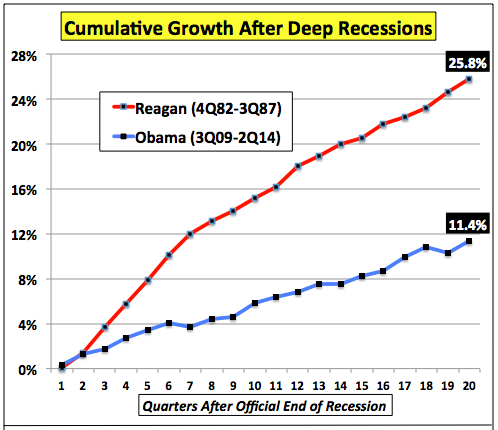 Here’s a chart comparing post-recession growth for both Presidents. And here’s the data on jobs, including breakdown of private-sector employment gains. 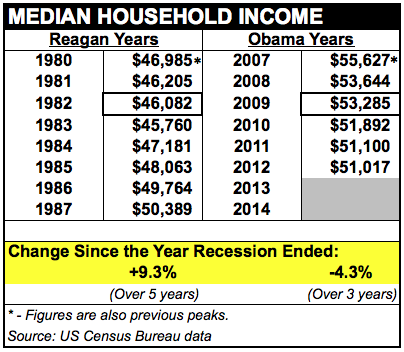 And here are the numbers for median household income. Once again, Obama is presiding over dismal numbers, particularly when compared to the Gipper. What’s especially ironic, as I explained back in March, is that rich people are the only ones who have experienced income gains during the Obama years. So Obama claims that his class-warfare policy is designed to hurt the wealthy, but the rest of us are the ones actually paying the price. Let’s look at one final chart. These poverty numbers weren’t included in the article, but I think they’re worth sharing because you can see that both the poverty rate and the number of Americans in poverty fell once Reagan’s policies took effect in the early 1980s. 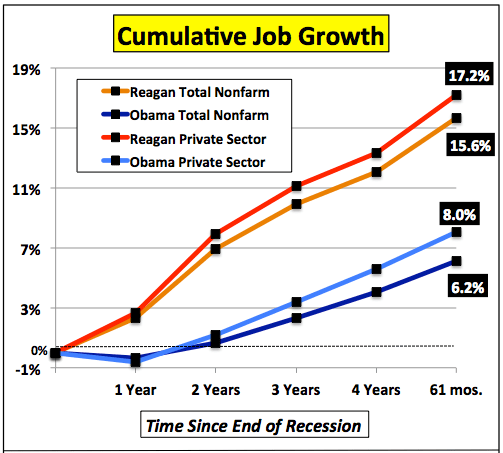 Under Obama, by contrast, the best we can say is that the numbers aren’t getting worse. One final point, I imagine that some leftists will argue that Mr. Blumer is being unfair by looking only at Reagan’s post-1982-recession numbers. That’s a fair point…but only if you think that the recession was caused by Reagan’s policies. Like most economists, I disagree with that accusation. The recession almost certainly was an unavoidable consequences of inflationary monetary policy in the 1970s. Indeed, Reagan deserves special praise for his willingness to endure short-term pain in order to address that problem and set the stage for future prosperity. Obama, by contrast, wants continued money printing by the Fed in hopes that easy money can cure problems caused by easy money. As you might imagine, I’m skeptical about that approach. i’ve never wondered why the american people love reagan: they’re idiots. he should have been impeached and sent to prison for iran-contra. congress, not reagan, lowered taxes but failed to cut spending sending the deficit over a cliff. and although he’s not soley responsible, i’ll never forgive him as comander-in-chief for the marines killed in lebanon. Reagan lowered taxes and Obama raised them. Enough said. The tragedy is that Reaganomics was temporary (they require eternal vigilance) while Obamanomics are permanent (they set the state and society on autopilot to flatter effort-reward curves, lower worldwide competitiveness, and inevitably decline). Watch how the “disappointed” Obama voter-lemmings will elect another Obama, because now, in a declining country, they really do need more and more state help in order to try to hang on to their American middle class standard of living (ie in the world’s top 5-10%). Or does anyone think that they will elect a Reagan — and let him repeal ObamaCare? Thank you for sharing that information! I found that to be a very interesting comparison.